Emily's clinic visit went well yesterday, all of her counts are looking good. She didn't need platelets since they are at 34 but they are still pretty low, hemoglobin is still on the low side of 7.9 where it has stayed all week, but Emily is in a great mood. Her spirits are wonderful and she is happy! Her sores are healing and she is able to put a bit more pressure on them. We learned that her sores were staff infection, we don't know the sensitivity of them yet, but the antibiotics that she is on will help take care of them. We haven't received the results back on the biopsy yet, but hopefully those should be back soon. Everyone has asked the question..."does this mean she is done with treatment?" to answer that, "no" . Emily has one more round of the nifurtimox trial with chemo! She started her pills back up on Thursday and Monday she will start her 5 days of chemo! After this we will travel to Michigan for scans with Dr Sholler! Our goal this whole treatment was to get Emily to antibodies and that is still out goal and we will fight for her to get it! Antibodies is supposed to get all the residual disease that may be dormant or hidden or any little spots left! So after scans and we meet with Sholler that is where she tells us what to do next and she knows we want antibodies so that is the hope! While the news that Emily's scans were completely negative with not being able to see any tumor sites was a total opposite of what we expected and i'm sure everyone else, we still have to charge on. Let us be very very honest we were shocked and honestly didn't believe it, but that is because for so long we always had spots show on the scans! We absolutely love and are so happy with the results of the scans, and we are in complete shock and awe with our jaws just being picked up toff the floor that VCU can't see anything. So with the awesome news that VCU provided we are celebrating!!! While they say that their scans are not optimal as compared to the ones at CHOP or MI, they are clear and Doug and I will take these results and run with them. We have ran with them to a campground with our best friends Sue and Jojo!! However knowing we could go to HDCH (MI) and show a little bit of spots (possibility bc we have to be real) but we are still so happy our little girl has fought as hard as she has and look where she is today! Many of you have said Emily is a hero, Emily is a fighter and she fights so hard and will continue to do so for the rest of her life! But we need lots of heroes out there, do a good deed, donate blood! 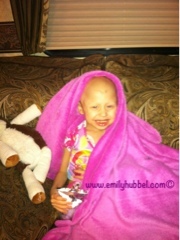 Emily is a princess fighter and she is one amazing fighter! We are in complete awe at all of the wonderful people, all the beautiful words and happiness that have been left, that we just can't thank all of you enough. So as of now we have met our besties sue and Jojo to camp for the weekend! Sue and Jojo thank you do much for traveling to celebrate this amazing wonderful news that we have received! We are so happy to have you guys in our lives! We are celebrating with you and keeping you all in our prayers! Woot!! Keep pressing in! I am still fasting as God just hasn't released me yet. Praying and praying for a smooth week and another set of clear scans! Have a wonderful celebration together...well done !